In April 2004, the United Nations General Assembly invited the World Health Organization (WHO), working in close cooperation with the United Nations regional commissions, to act as coordinator on road safety issues across the United Nations system. 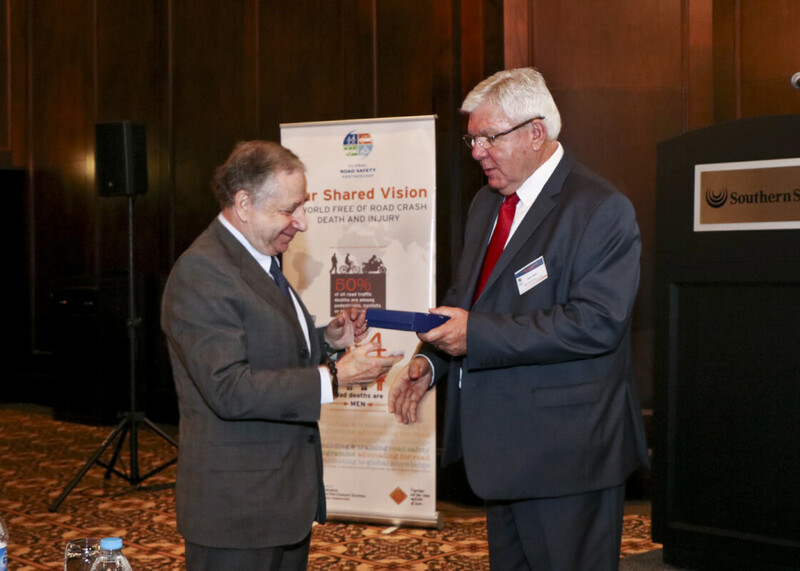 WHO subsequently set up the United Nations Road Safety Collaboration (UNRSC) which holds biannual meetings to discuss global road safety issues. We have been one of four organizations that collaborated to produce the Global Good Practice Manuals on Helmets, Seat Belts and Child Restraints, Drinking and Driving, Speed Management, and Data Management. We chair the “Good Practice” committee of the UNRSC. Together with many partners, we have helped create the Global Road Safety Commitment, a simple, one page document aimed at helping organizations start on a journey towards zero road crash death and injury. 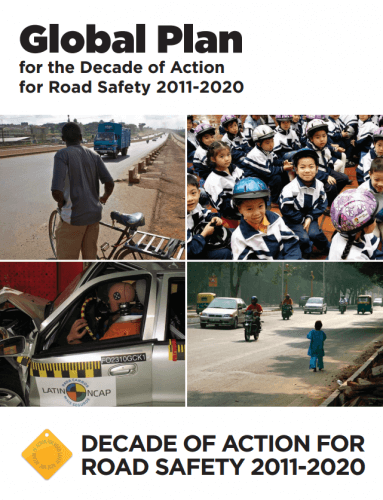 We have contributed to the development of the Global Plan for the Decade of Action, a guiding document that is helping to create a consistent approach to managing road safety. In our role as the Reference Centre for Road Safety for the International Federation of Red Cross and Red Crescent Societies, we help bring the voice of the world’s largest humanitarian organization to address road safety issues, particularly by developing the formal auxiliary role to public agencies that the Red Cross Red Crescent societies have in their countries. One of the new Sustainable Development Goals (SDG) targets (3.6) is to halve the global number of deaths and injuries from road traffic crashes by 2020. Our road safety programmes, seminars, and advocacy initiatives contribute directly to this goal. I believe we need a strong and united road safety coalition to generate and maintain strong momentum both towards reaching the goals of the UN Decade of Action for Road Safety and doing so in a sustainable way looking at the horizon of 2030. Around the world, people are getting on board the United Nations’ call for a Decade of Action for Road Safety. 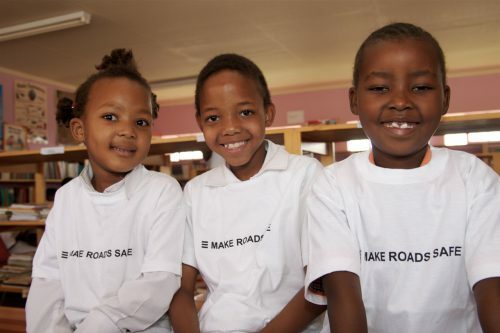 Above three children from South Africa sport T-shirts from the Make Roads Safe campaign, a project of the FIA Foundation, which is also a member of the Global Road Safety Partnership’s Executive Committee. We must remember that in a decade, youths and children will be drivers or riders. It is important that the correct road behaviours are instilled in them from an early age. And we know how quickly it can pass. Yet it is amazing what can be achieved in such a short period. An infant can grow to become a sixth-grade student, capable of creating imaginative paintings, writing fantastic stories, learning new languages, calculating sums or performing great feats of athleticism — and walking him or herself to school. In another ten years, that child could be finishing school, joining the workforce, starting a new business, volunteering in the community and supporting the next generation of learners — and driving a motorcycle, car or heavy truck. In coming decades, he or she might raise a family, become a community leader, a business owner, a teacher, a worker — an elder capable of providing economic security and support for the upcoming generations. What will you do in the next ten years to ensure that all the people you care about can move freely and safely, so they thrive and make positive contributions to your community? The goal for the Decade of Action for Road Safety is to stabilize and then reduce by 50% the level of road traffic fatalities around the world. Since its inception, we have focused on facilitating partnerships that connect each of these five pillars. The Partnership has created and improved road safety management systems, encouraged better road user behaviour and helped partners implement good practices globally. We have the capacity to translate the Decade goals into on-the-ground, measurable results. 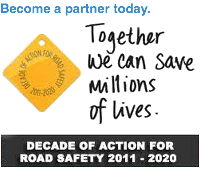 When the 64th General Assembly of the United Nations passed a resolution in May 2010 proclaiming 2011-2020 the Decade of Action for Road Safety, it recognized the crucial role that multi-sector partnerships play in implementing Decade of Action goals on the ground. The Global Road Safety Partnership’s expertise in delivering partnership-based road safety interventions means that we play a key role in helping diverse partners achieve their own Decade of Action goals. As one of the main organizations in the United Nations Global Road Safety Collaboration, we helped lay the foundation for the Decade of Action. The Partnership contributed even more by working with members at the global and community level, identifying partners, designing campaigns, implementing interventions, and developing systems for measuring the results. 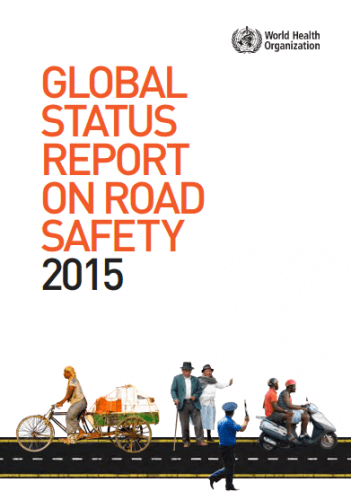 The Global Status Report on Road Safety 2015, published by the WHO and reflecting information from 180 countries, indicates that worldwide the total number of road traffic deaths has plateaued at 1.25 million per year, with the highest road traffic fatality rates in low-income countries. 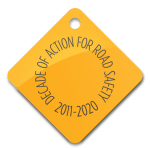 The UN Road Safety Collaboration has developed a Global Plan for the Decade of Action for Road Safety 2011-2020 with input from many partners through an extensive consultation process through meetings and the Internet. The Plan provides an overall framework for activities which may take place in the context of the Decade. WHO article shows how Sakhalin partnership made seat-belts "cool"